Martin “Tino” Becker was born on 12 April 1916 at Wiesbaden in Hesse.  Becker’s service with the Luftwaffe began in 1940 flying with an unknown reconnaissance unit. He flew 27 reconnaisance missions. In early 1943, Becker transferred to the Nachtjagd, being posted to 11./NJG 4. On 1 August, 11./NJG 4 was redesignated 2./NJG 6. Becker scored his first victory on the night of 22/23 September 1943. 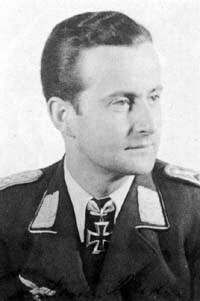 On 17 October 1943, Becker was appointed Staffelkapitän of 2./NJG 6. He shot down three RAF bombers on the night of 20-21 December to record his 4th through 6th victories and began a series of multiple victories that included four victories on the night of 19/20 February 1944 (7-10) and six on the night of 22/23 March (13-18). On the night of 30/31 March 1944, Becker and his crew took off from Mainz Finthen at 23:45. Between 00:20 and 00:50 they shot down three RAF Lancaster and three RAF Halifax four-engine bombers in the area of Wetzlar and Fulda. On their way back to home base they shot down another Halifax over Luxemburg at 3:15. Becker was awarded the Ritterkreuz on 20 April 1944 for 26 victories. Becker’s series of multiple victories continued with three enemy aircraft shot down on each of the nights of 26/27 April and 27/28 April. On the night of 28/29 July, he claimed four and, on the night 25/26 August, he claimed a futher three (39-41). Becker was appointed Gruppenkommandeur of IV./NJG 6 on 20 October 1944. He had 43 victories to his credit at this time. On the night of 21/22 February 1945, he shot down three enemy aircraft (46-48). Becker’s crowning achievement, and a Nachtjagd record, came on the night of 14/15 March 1945, when he claimed nine Lancaster bombers (49-57), including three shot down by his crewman Karl Johanssen with his MG 131 rearward facing armament. Becker recorded his 58th and last, victory on the night of 16/17 March. Hauptmann Becker was awarded the Eichenlaub (Nr 792) on 20 March. Martin Becker flew 83 nightfighting missions, in which he shot down 58 enemy aircraft, mostly four-engine bombers. 1:30 Viermot 2./NJG 6 FF "Christa"
1:35 Halifax 2./NJG 6 Near FF "Christa"